Do you want to be in the spotlight at the top of the rail industry? Then advertising or becoming a partner of RailTech.com would be the logical option to achieve your goals. 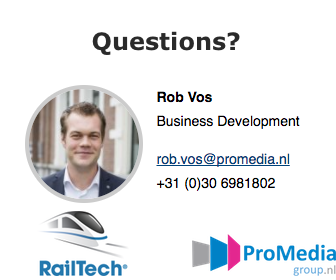 RailTech.com is a publication of ProMedia Group, a leading online publisher of business-to-business magazines. We believe in quality journalism and we have the ambition to be the expert in our areas of operation. In addition to writing news, background articles and interviews, we also produce videos for publication on our online web channels. Complementing our publications we also organise conferences, exhibitions and training courses. Would you like to be present in the rail industry and get more out of online marketing and advertising? Please contact us for a chat about the possibilities.